This mountain of oyster shells is on the property of Kellum Seafood in Weems. Owner Tommy Kellum donated an acre of leased bottom to Friends of the Rappahannock for the current restoration project. The Dominion Energy team from left includes, distribution forestry coordinator Kelly Balderson, supervisor Gary Litzinger, electric transmission and distribution safety and training senior instructor Bernard Moughon and North Anna supply chain sourcing specialist Elizabeth Rock. A $15,000 grant from Dominion Energy will support Friends of the Rappahannock (FOR) in an ecological initiative to improve water filtration through the restoration of oyster beds in the Rappahannock River. Funds from the Dominion Energy Charitable Foundation will be used to replenish oyster beds on leased bottom areas in Carter Creek and Urbanna Creek. Oysters provide a variety of ecosystem services to the region and are an essential part of the local seafood economy, reported Bryan Hoffman. An individual mature oyster can filter up to 50 gallons of water every day, which results in more healthy reefs to provide more clean water. 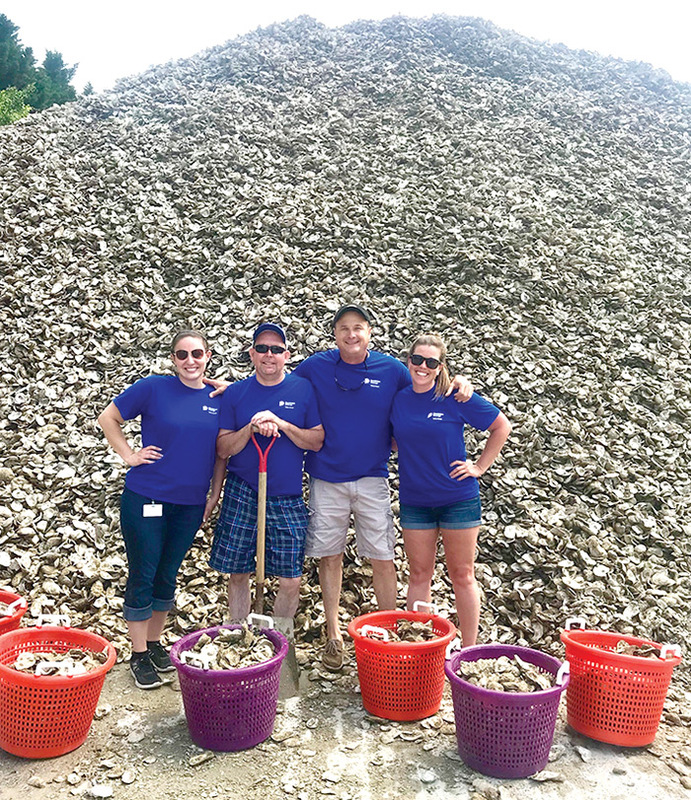 FOR will use this grant from Dominion Energy to work with volunteers and watermen to install about 3,000 bushels of oyster shells into the targeted areas. FOR also is looking for smaller groups of students and community volunteers to join them on the river to learn about environmental sustainability, oysters and the Rappahannock River. “Our region’s watermen depend on the health of the river’s oyster beds and we are excited to work toward having a significant impact on the river’s water quality and really make a splash, pun intended,” said Hofmann. To get involved, visit riverfriends.org.